I find myself writing posts commemorating the death days rather than the birthdays of my favorite artists. As some of them, like Mr Hitchcock and Mr Dahl, tend towards the macabre, it’s rather fitting. Today marks the 31st anniversary of Alfred Hitchcock’s death. I had intended on watching one of his movies every night this week. That, of course, failed, with my thesis presentation on Thursday. I did, however, manage to see The Birds at a local cinema on Monday night (which was wonderful), and To Catch a Thief on Tuesday. I believe tonight Holmes and I will finally finish watching Sabotage and perhaps watch another of Mr Hitchcock’s films. Hitch is a director I came to rather recently. I had seen his second version of The Man Who Knew Too Much during my sophomore year of college, but hadn’t seen any of his other movies. Cue Psycho‘s jarring strings. Holmes needed to watch it for a class, and I, the ever ready film viewer hoping to reap the benefits of her class minus the homework. From Saul Bass’s credits, I was hooked. The film entranced me, so much so that I watched the film several times over the course of the semester, even writing senior thesis number one about Psycho. Psycho put Holmes and I on a quest: to see as many of Hitch’s films as possible. As he directed 52 surviving movies, we have our work cut out for us. I have fourteen under my belt, which is more than most people can say. There’s something delightful about working our way through a director’s canon. I wouldn’t have seen many of his movies without this goal. Strangers on a Train, Rope…great movies I otherwise would have ignored. My enjoyment of Hitch’s films have inspired my visual art as well. I’m undergoing a personal project to create a series of posters for his movies. 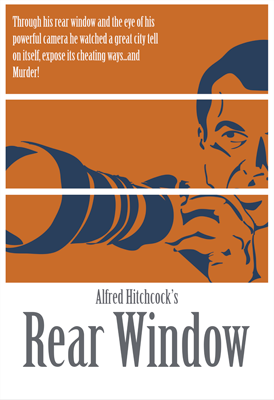 One is completed: Rear Window. I intend on making posters for Psycho, The Birds, Rope and maybe even Strangers on a Train. So, Mr Hitchcock, thanks for all the movies. Rear Window is one of my most fave films ever EVER. I love your poster; a really cool retro feel. Hitchcock, for me, can never be equalled. There’s an interview with him floating around on YouTube and every word from his mouth is pure wisdom. I’m ashamed to admit there’s many of his films I haven’t yet seen but I will put this right eventually. Beth, you have superb taste in film and TV (well, it’s similar to mine anyway!). Thanks very much! I’m quite fond of creating posters. I’ll have to see if I can find that interview. That is a cool poster. Hitchcock is my favorite director. Have you seen Vertigo yet? Oh, and I must mention Rebecca. You’ll never forget Dame Judith Anderson as Mrs. Danvers. Thank you! I was messing around after my web design class one day and put it together. Seen them both! Vertigo was the fourth or fifth of Hitch’s films. And have seen Rebecca as well. Mrs. Danvers was certainly creepy.